Are you tired of your job? Do you want to make crazy inventions, like fart guns and cookie robots, and help use them in a multitude of sinister schemes? Do you want to have your salary paid in bananas? If any of this sounds appealing, you may be a great candidate for becoming a career minion! In addition to your desire to dabble in mad science, you'll also need a few accessories for your uniform, like this Adult Minion Headpiece. 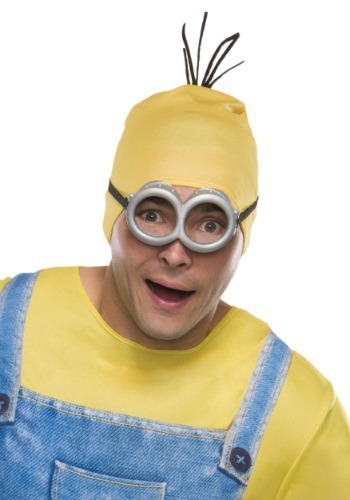 Now, slapping on this headpiece won't make you a minion overnight, but it's a step in the right direction. The polyester cap will fit snugly over your noggin, to protect your human hair from any lasers and flamethrowers your minion team might be experimenting with. All you need now is a pair of goggles and some blue Minion overalls, and you'll fit right in with Bob, Kevin, and the rest of Gru's crew!